There is something special about musakka recipes; they always turn out great. Although musakka, the term Arabic in origin, does not resemble the Arabic dish which is a kind of cold eggplant appetizer; although musakka means a different dish in a lot of countries such as Bulgaria, Greece, Romania, and Turkey; and although the musakka dish has numerous versions even in one country, a musakka dish is always delicious. In Turkish cuisine musakka is usually prepared with fried eggplant, tomato, peppers, and ground meat. This zucchini musakka recipe comes from Musa Dağdeviren, the owner and chef of famous Çiya Restaurant in İstanbul. I had also tried his mualle recipe before. 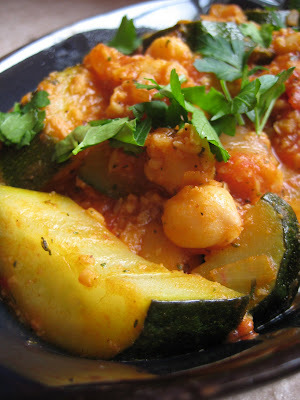 This is not well-known or traditional recipe since it uses garbanzo beans. I replaced ground lamb with ground beef and it is still delicious. If you want to try it with ground lamb, you can find the original recipe here. -Prepare a bowl of salty water and soak sliced zucchini for half an hour. -Heat 2 tbsp olive oil in a broad deep pan. Add ground meat and cook until browned and all the juice is gone. -Add garlic and onion, cook for approximately 5 more minutes. -Add tomato paste and pepper paste (or chile sauce). Let simmer for 2 to 3 minutes. -Stir in diced tomato. Cook for 5 minutes. -Add zucchini slices. Cook on medium heat, stirring, until tender. -Stir in garbanzo beans. Cook for a couple of minutes. -Season with salt and pepper. Transfer zucchini musakka into a bowl. Sprinkle with mint and parsley. -Musakkas are always good with white rice, crusty bread, and yogurt. 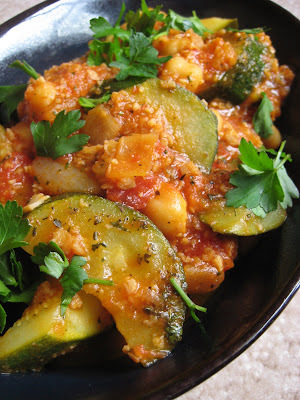 0 Response to "Zucchini Mousakka with Garbanzo Beans (Nohutlu Kabak Musakka)"